Metro Extension Display Hanger clips onto wire shelving for an extended display hanger. 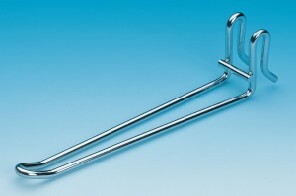 Snaps on Super Erecta shelf hanger rails and shelf frames. Accepts standard carded merchandise.